A hub of fun and games, this station's architectural elements harmonize with the arena and the historic West End, now an entertainment district. Throughout the station, light and movement reflect the dynamics of play, with pavement patterns that evoke balls bouncing wildly in every direction. 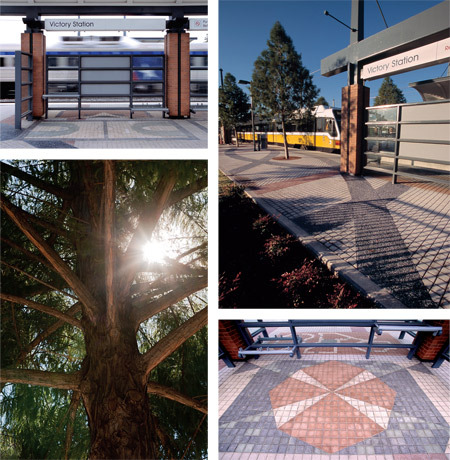 Pavers in different values of gray create an effect similar to the play of lights. The station features game boards, playing fields and cards - some familiar, some fanciful - under the canopy area. A clearly defined pedestrian plaza directs event-goers to the front doors of American Airlines Center.